You are currently browsing the tag archive for the ‘rates of incarceration’ tag. 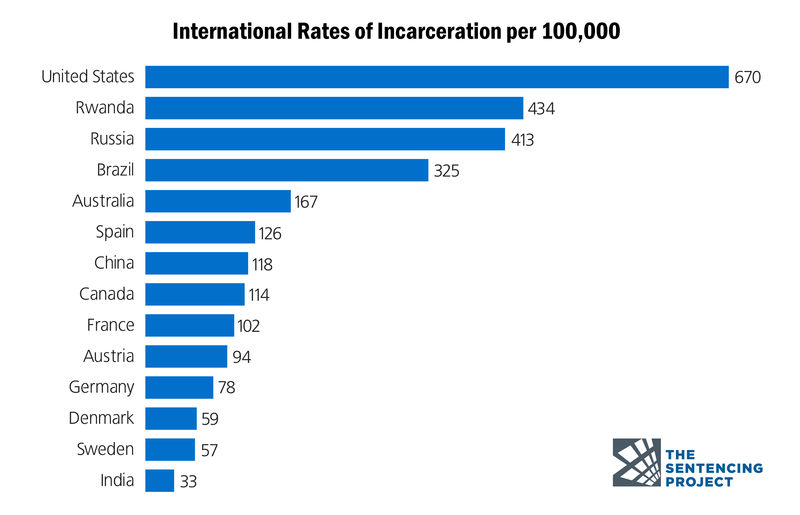 The United States (the land of the free) is the world’s leader in incarceration! Yay! There are 2.2 million people in the nation’s prisons and jails—a 500% increase over the last 40 years. Changes in law and policy, not changes in crime rates, explain most of this increase. The results are overcrowding in prisons and fiscal burdens on states, despite increasing evidence that large-scale incarceration is not an effective means of achieving public safety. We started sending more people to prison. 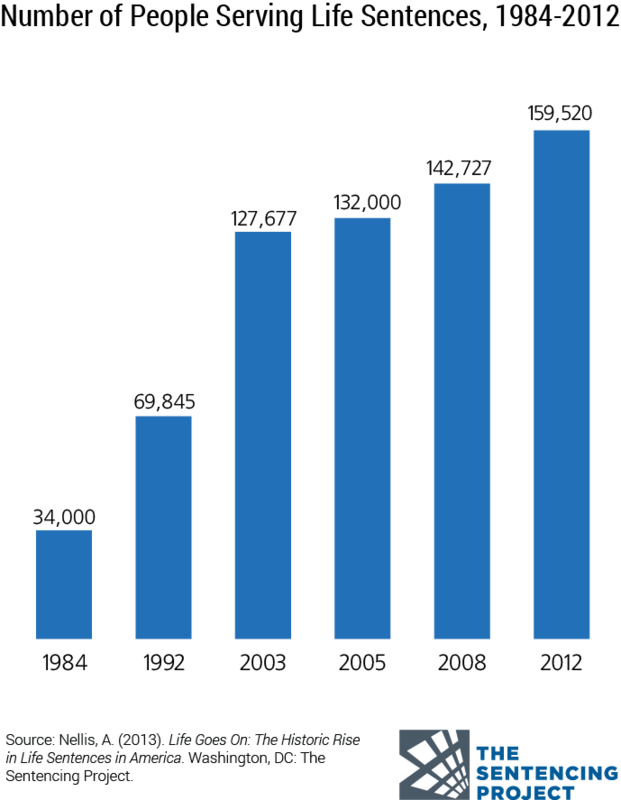 A series of law enforcement and sentencing policy changes of the “tough on crime” era resulted in dramatic growth in incarceration. Since the official beginning of the War on Drugs in 1982, the number of people incarcerated for drug offenses in the U.S. skyrocketed from 40,900 in 1980 to 450,345 in 2016. 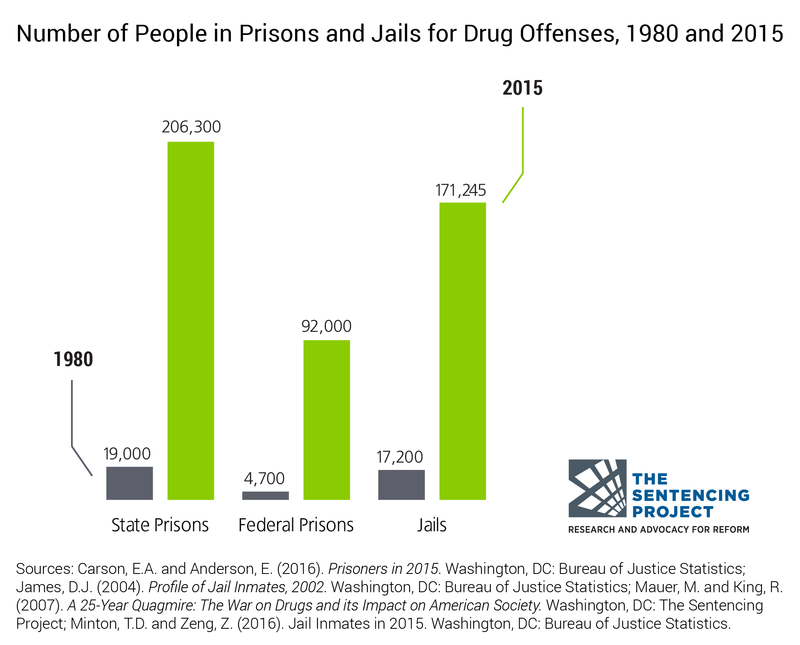 Today, there are more people behind bars for a drug offense than the number of people who were in prison or jail for any crime in 1980. The number of people sentenced to prison for property and violent crimes has also increased even during periods when crime rates have declined. We started sending people to prison for much longer terms. Harsh sentencing laws like mandatory minimums, combined with cutbacks in parole release, keep people in prison for longer periods of time. 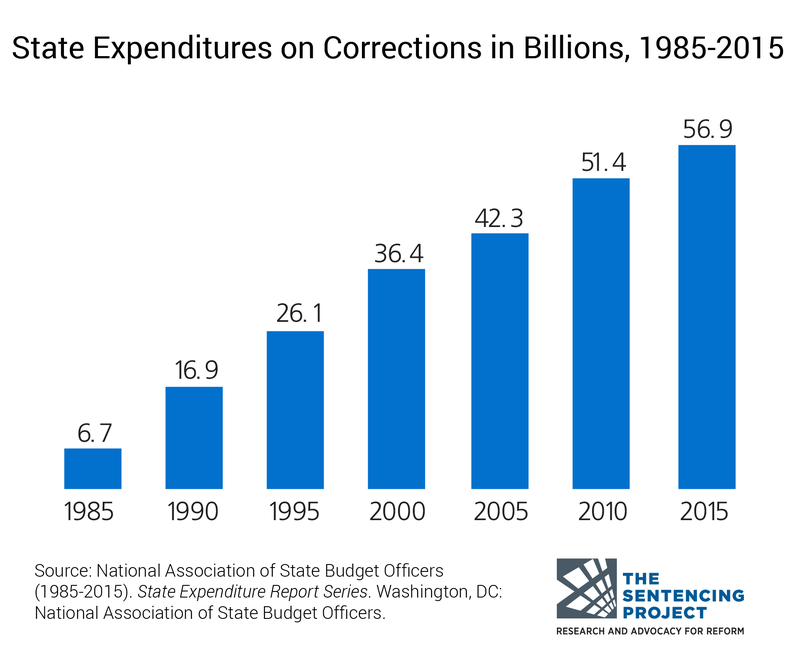 The National Research Council reported that half of the 222% growth in the state prison population between 1980 and 2010 was due to an increase of time served in prison for all offenses. There has also been a historic rise in the use of life sentences: one in nine people in prison is now serving a life sentence, nearly a third of whom are sentenced to life without parole. Sentencing policies, implicit racial bias, and socioeconomic inequity contribute to racial disparities at every level of the criminal justice system. 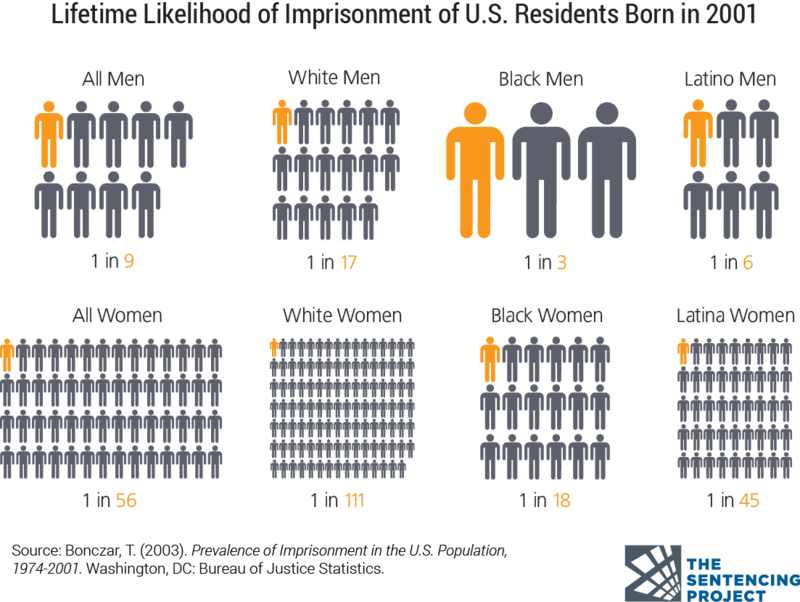 Today, people of color make up 37% of the U.S. population but 67% of the prison population. Overall, African Americans are more likely than white Americans to be arrested; once arrested, they are more likely to be convicted; and once convicted, they are more likely to face stiff sentences. 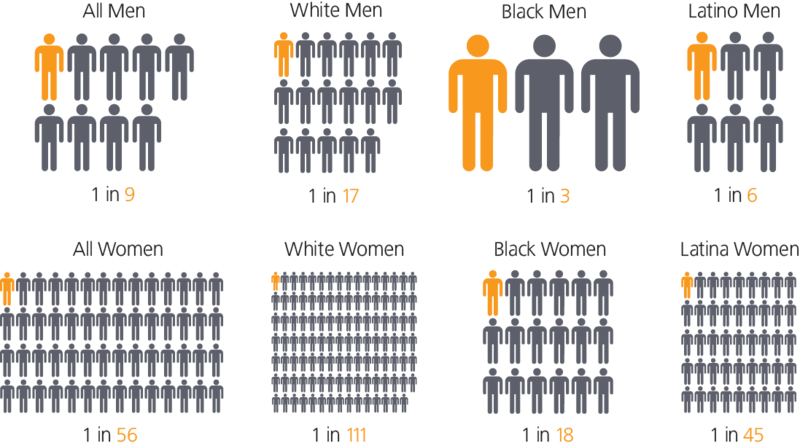 Black men are six times as likely to be incarcerated as white men and Hispanic men are more than twice as likely to be incarcerated as non-Hispanic white men. Incarceration has some impact on crime, but the impact is one of diminishing returns. Crime rates have declined substantially since the early 1990s, but studies suggest that rising imprisonment has not played a major role in this trend. The National Research Council concluded that while prison growth was a factor in reducing crime, “the magnitude of the crime reduction remains highly uncertain and the evidence suggests it was unlikely to have been large.” Several factors explain why this impact was relatively modest. First, incarceration is particularly ineffective at reducing certain kinds of crimes: in particular, youth crimes, many of which are committed in groups, and drug crimes. When people get locked up for these offenses, they are easily replaced on the streets by others seeking an income or struggling with addiction. As a result, the excessive sentencing practices in the U.S. are largely counterproductive and extremely costly. 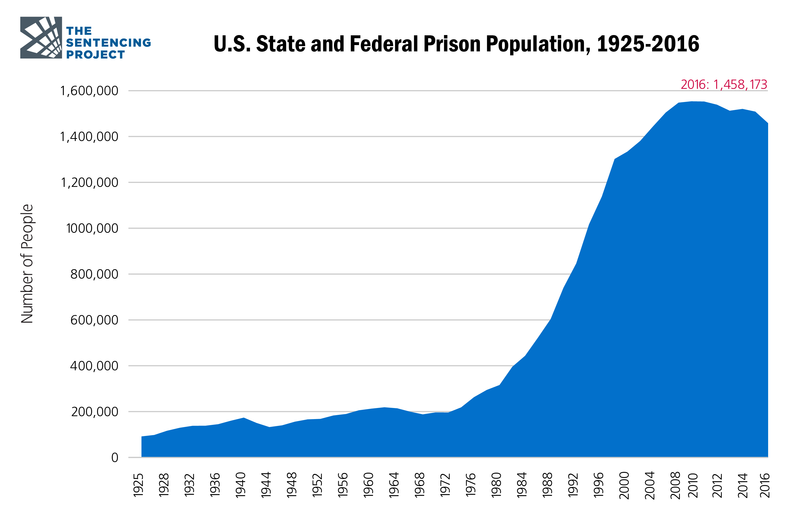 After nearly 40 years of continued growth, the U.S. prison population has stabilized in recent years. This is partially a result of declining crime rates, but has largely been achieved through pragmatic changes in policy and practice. For more than a decade, the political climate of criminal justice reform has been evolving toward evidence-based, commonsense approaches to public safety. This can be seen in a variety of legislative, judicial, and policy changes that have successfully decreased incarceration without adverse impacts on public safety. As promising as these changes may be, we are a long way from solving our national problem of mass incarceration—and the way forward is clear. Where do we need to go from here? Just as a bicycle works best when it uses different gears based on the terrain, we need a justice system that has different responses for different situations—shifting gears to treatment, prevention, and long-term public safety solutions as appropriate. By taking a practical approach to criminal justice reform, we can decrease crime, enhance public safety, and make more responsible use of our resources. Eliminating mandatory minimum sentences and cutting back on excessively lengthy sentences; for example, by imposing a 20-year maximum on prison terms. Shifting resources to community-based prevention and treatment for substance abuse. Investing in interventions to that promote strong youth development and respond to delinquency in age-appropriate and evidence-based ways. Examining and addressing the policies and practices, conscious or not, that contribute to racial inequity at every stage of the justice system. Removing barriers that make it harder for individuals with criminal records to turn their lives around.